This is one of the recipes that’s worth making a big batch and freezing it in portions. It’s even tastier if it has time to rest, and it freezes & thaws well. So go ahead and get your big soup pot out to make this. Adapted from “Chilli sin carne al mole”, that can be found in the book Vegan with a vengeance, by Isa Chandra Moskowitz. The night before, place beans in separate bowls, cover with water, add 1 tsp cumin to each and soak overnight. The next morning, drain the beans, put in separate cooking pots, cover with about double the water, add a bay leaf and 2/3 tsp salt to each, bring to a simmer and cook for 45-50 minutes, until soft. Drain. In a big heavy bottomed soup pot (~7l), heat up the oil. Add onion, shallot and garlic and cook, stirring, on medium heat, until transparent. Add the peppers and cook until they start to soften. Add the quorn, stir to brown slightly. Add all spices and stir, cook for 30-60 seconds, then add the tomatoes, cocoa powder, agave, cooked beans, and vegetable broth. Cover and bring to a simmer. Cook, stirring from time to time, for about 30 minutes. Let rest for at least half an hour, the more the tastier though. Reheat if needed before serving. Servings: 8-10 servings, depending on hunger and what it is served with. I like to serve it with either rice, wheat, or potatoes. If you can’t find quorn, you can use minced seitan, or textured soy protein, or whatever other vegetable protein mince of your choice. If you don’t want to bother with dry beans, you can substitute canned ones. The 375 gr dried beans yielded 875 gr cooked beans. Make sure to rinse canned beans well. I like to use a mix of white and red because it makes the dish a bit less monocolor. 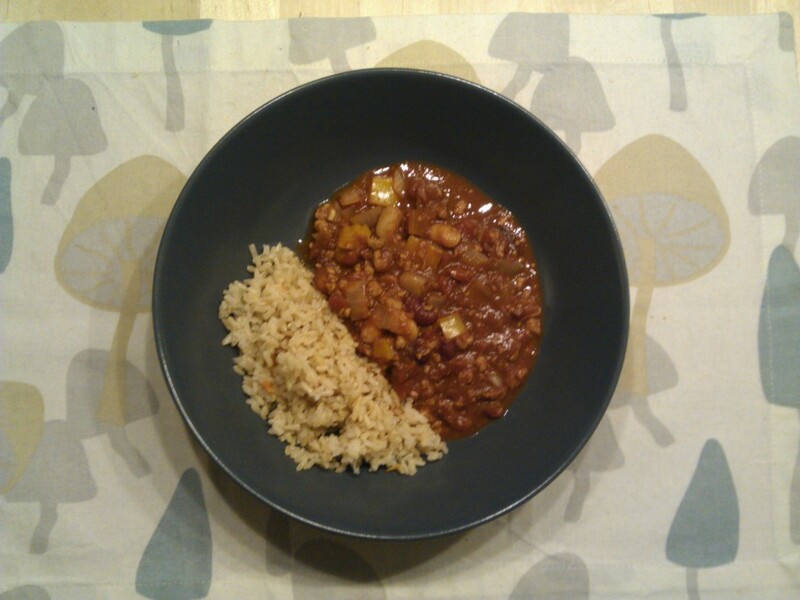 On the picture you can see the chilli served with brown rice. Oh, and by the way, that’s only half a serving, I don’t like my food to get cold so I serve it in two times.